Don’t know if you’ve heard, but it’s hot everywhere. The U.S.? Hot. Mozambique? Hot. Mongolia? Yeah, also hot. The top 2,200 feet of the ocean? Cooking. That’s why they call it global warming, folks. On Thursday, scientists with NASA and the National Oceanic and Atmospheric Administration (NOAA) released their annual checkup on our planet. No word on its cholesterol levels or if it could pass the presidential fitness test, but they let us know the planet is running a major fever. NASA ranked 2017 as the second-warmest year on record and NOAA scientists said 2017 came in as the third-warmest, after setting back-to-back-to-back global temperature records from 2014-16. 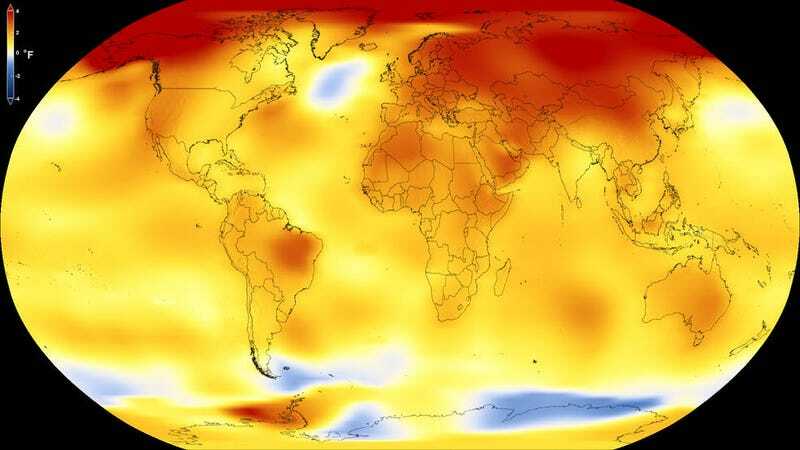 The slight differences are due to how they calculate temperatures in places without thermometers and NASA including more of the polar regions (you know, the fastest-warming parts of the world), but the message is clear: The planet is cooking and there’s nothing natural about it. “Basically all of the warming in the last 60 years is attributable to human activities and carbon emissions are the number one component of that,” Gavin Schmidt, NASA’s chief climate scientist, said in a call with reporters. The world has warmed about 1 degree Celsius since record keeping began in the 1880s, a process that’s raised ocean levels, melted sea ice, and influenced shifts in weather patterns around the globe. And the heat has only gotten more intense in the past decade. All five of the world’s warmest years have occurred since 2010. The warmth we’re currently dealing with is unprecedented in the instrument record and likely a lot longer than that. The “coolest” month of 2017 was hotter than the hottest month of any year prior to 2001 according according to Larry Hamilton, a science policy researcher at the University of New Hampshire. Last year’s near-record heat was particularly pronounced in the Arctic according to NASA’s analysis. Meanwhile, NOAA’s analysis showed that the land and oceans below 20 degrees South had their hottest year on record. That region includes the southern half of South America, parts of Africa and nearly all of Australia. The heat record set in 2016 was boosted by El Niño, a warming of tropical Pacific Ocean waters that can give global temperatures a slight bump. A study released earlier this week shows that bump, while also noting that the heat explosion was due to all the extra energy we’re trapping on the planet with greenhouse gas pollution. El Niño added 0.12 degrees Celsius of warming to 2016's record according to Schmidt, which was 0.99 degrees Celsius above the 1951-1980 baseline. Compare that to 2017's 0.9 degrees Celsius and you have a basic statistical tie. With all other things being equal, “2017 with ENSO removed would have been the warmest year” Schmidt said. And that’s just what’s happening on the surface of the Earth. Most of that heat is pouring into the oceans. Data released on Thursday show that 2017 set a record for the most heat content on the top 2,200 feet of the ocean. Moral of the story is the globe is hot. And its gonna get hotter unless we start to cut greenhouse gas emissions.